AAA State of Play Blog: 10 Unique and Fun Writing Prompts for Kids to Celebrate NaNoWriMo! 10 Unique and Fun Writing Prompts for Kids to Celebrate NaNoWriMo! Started in 1999, National Novel Writing Month (NaNoWriMo) gives writers the encouragement to pen 50,000 words during the month of November. I admire the novelists who participate in NaNoWriMo, and this year, I decided to get my girls involved. Here are ten unique and fun writing prompts we can use to help our kids celebrate NaNoWriMo, whether or not they're up for the challenge of trying to write a full novel. A talking cat and dog visit a farm. What do they see, think, experience, and say? My girls often imagine what animals would say if they could talk. Now, they can put their imaginative thoughts onto paper with a prompt that also encourages them to consider animal behavior and develop empathy. What would your day be like if you were a snowflake? Our kids can tap into their creativity and explore science, geography, and weather as they complete this adventurous and fun writing prompt. Write a story, poem, or song about three random objects you see in the room right now. It's easy to connect related items like pizza, a plate, and cheese, but our kids get to think outside of the box when they connect random objects like paper, shoes, and a trumpet. In addition to creativity, this prompt helps kids explore different types of writing styles, since they can write a story, poem, or song about their chosen objects. What would you do if you could become invisible whenever you wanted? Our kids can explore their interests, values, and imagination as they reply to this writing prompt. As a twist, we could challenge kids to write about how other people would respond to their ability to become invisible. If you could do anything you wanted for an entire day, what would you do and why? Sometimes, when my girls feel discouraged, sad, or upset, I ask them to think about their dream day. They have fun thinking about all of their favorite things, and in no time, they feel better. This prompt also helps my girls examine the interests that make them unique. Write an ad for your favorite food, book, or game. When writing an ad, our kids practice summarizing and persuading. Writing ads also helps our kids recognize the elements of sales pitches and become more discerning shoppers. Pretend you're the king or queen of an underwater world and write about your day. Our kids can research ocean life and learn more about the animals and plants that live in the water when they plan their day as an underwater ruler. As a bonus, we can use this prompt to help our kids discern what kind of leader they would want to be and what values they appreciate in the teachers, parents, coaches, and leaders in their life. Rewrite the ending of your favorite movie. What would you change and why? My girls each have a favorite movie they can recite by heart. I like this prompt because it challenges them to rethink the ending and choose a different path for their favorite characters as they tell a story. It also invites "what/if" conversations that help them think through consequences of actions, an important life skill. What would you think, feel, and experience if you looked up and saw ice pops raining from the sky? In addition to creativity, our kids can express their imaginations and think about their feelings when they face unexpected circumstances. This exercise also expands their writing talents and their emotional expression. Write a letter to your future self to read in ten years. Despite their biological age, my girls often show wisdom beyond their years. 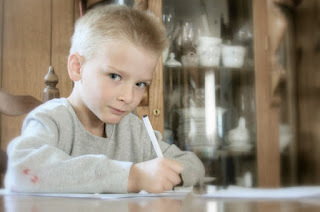 Writing a letter to their future selves gives our kids an opportunity to express their thoughts, feelings, and dreams, and it's good letter-writing practice. Our kids need to know how to write. Let's encourage them to develop this skill with these ten writing prompts. As a bonus, they can celebrate NaNoWriMo and gather a greater appreciation for writing. What other prompts would you suggest?